Whether your little one is really, really brave and has actually seen lots of horror movies or they just want to look very, very scary, we applaud your kid’s dark take on our favorite holiday, Halloween! And if you can’t get behind their look, then they may just be looking for their next victim. Now, normally, the only serial killing that goes on in your house is when your kiddo pounds through a second bowl of honey nut O’s. Cereal killing, get it? But in all seriousness, you will be too terrified to even pour the frosted wheats when a mysterious figure arrives at the breakfast table in this Child Bleeding Ghost Face Costume. They look like the deranged killer from the movies, but...they are calling you “Mom,” as in, “Mom, pass the syrup?” Now, granted, they’ve used a voice distorter, so you can’t be sure who is really hiding beneath this ghastly getup. But our recommendation is that your should probably do what they ask and pass the syrup and we’ll hope for the best for you. 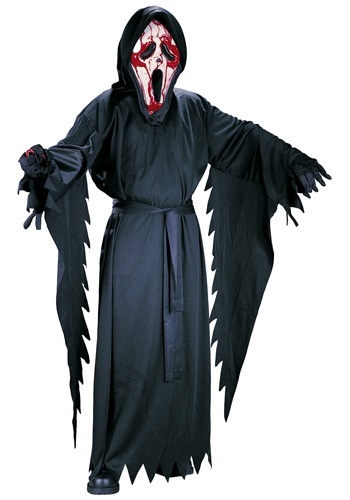 Because whomever’s under there has a wicked outlook on Halloween and looks theatrically terrifying in this iconic black hooded cloak and a mask that really drips fake blood. Pick up a fake knife accessory to complete this killer look and...wait a minute...we thought your kid didn’t even like syrup. Oh man, (shudder) who is the cereal killer at the table then?